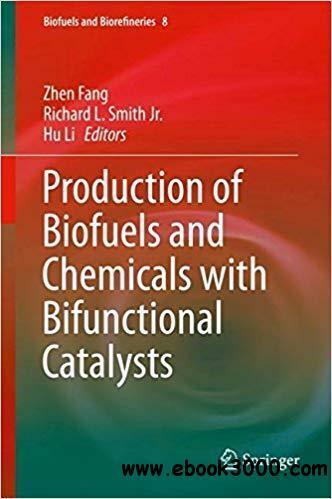 This book provides state-of-the-art reviews, current research, prospects and challenges of the production of biofuels and chemicals such as furanic biofuels, biodiesel, carboxylic acids, polyols and others from lignocellulosic biomass, furfurals, syngas and ��-valerolactone with bifunctional catalysts, including catalytic, and combined biological and chemical catalysis processes. The bifunctionality of catalytic materials is a concept of not only using multifunctional solid materials as activators, but also design of materials in such a way that the catalytic materials have synergistic characteristics that promote a cascade of transformations with performance beyond that of mixed mono-functional catalysts. This book is a reference designed for researchers, academicians and industrialists in the area of catalysis, energy, chemical engineering and biomass conversion. Readers will find the wealth of information contained in chapters both useful and essential, for assessing the production and application of various biofuels and chemicals by chemical catalysis and biological techniques.